It's the first time Juan Guaidó and President Donald Trump have spoken. One week after recognizing him as the interim president of Venezuela, President Donald Trump called the country's opposition leader Juan Guaidó to "reinforce President Trump's strong support for Venezuela's fight to regain its democracy." It's the first time the young leader and Trump have spoken since Guaidó was sworn in, but it's just the latest show of support from the U.S. for his fledgling government and its fight to oust socialist leader Nicolás Maduro. After the U.S. announced $20 million in humanitarian aid on Thursday, sanctions on the state-owned oil company on Monday and moves to turn financial assets over from Maduro to Guaidó on Tuesday, the State Department's new special envoy for Venezuela Elliott Abrams said Wednesday, "There will be more." Vice President Mike Pence will travel with his wife Karen and Guaidó's new envoy to Washington Ambassador Carlos Vecchio to Miami on Friday to meet Venezuelan exiles and rally support for Guaidó, a White House official confirmed. Pence will deliver formal remarks and participate in a round table discussion at Iglesia Doral Jesus Worship Center. Maduro -- who has been backed by allies such as Cuba, Russia, Nicaragua and Bolivia -- has accused the U.S. of staging a coup against his government. That has been fueled by Trump's own previous comments about a military intervention and U.S. national security adviser John Bolton's scribbled notes about "5,000 troops to Colombia" on Monday. 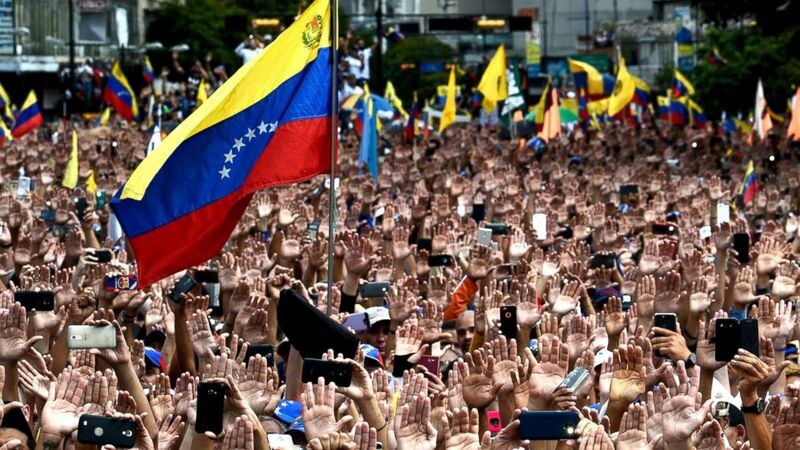 (Frederico Parra/AFP/Getty Images) People raise their hands during a mass opposition rally against President Nicolas Maduro in in Caracas, Venezuela, Jan. 23, 2019. 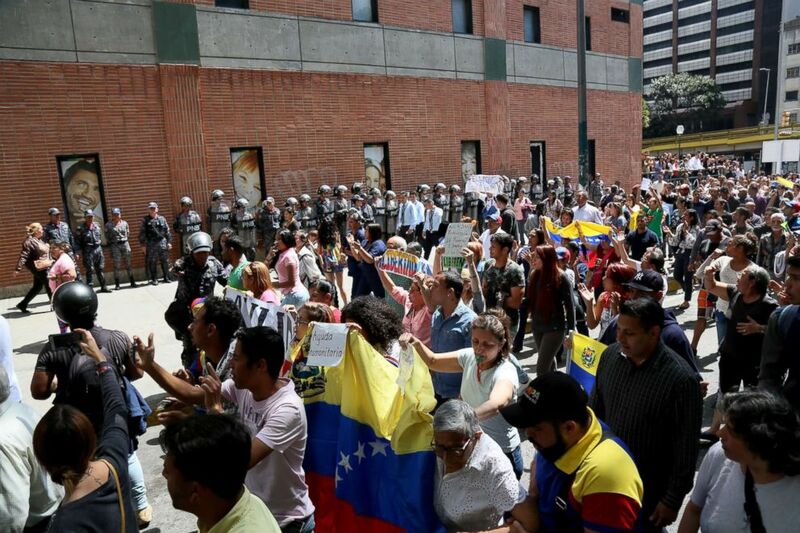 But Guaidó says his movement is backed by the people of Venezuela, powered by days of nationwide protests and authorized by the country's constitution after Maduro consolidated power and cracked down on opposition. His own envoy to Washington, Vecchio said there have been no conversations about U.S. military support. "We haven't talked about any other options," Vecchio said Wednesday, beyond humanitarian aid and coordinating the international recognition of Guaidó. 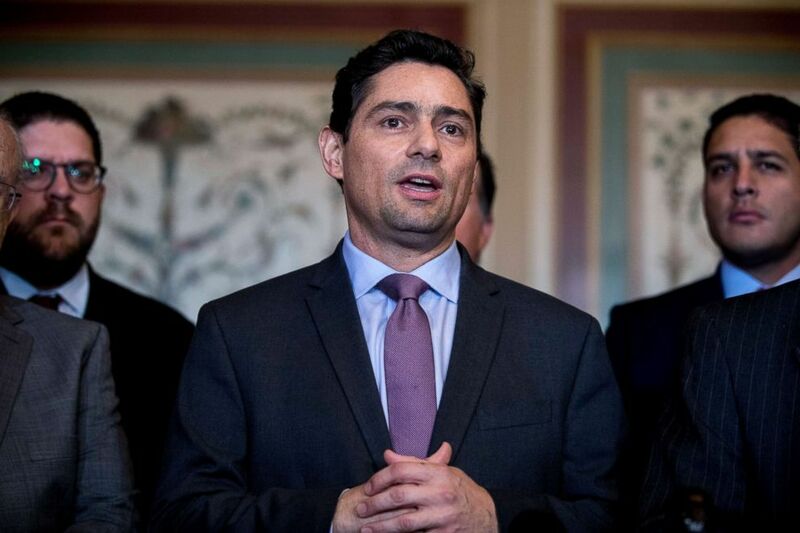 (Andrew Harnik/AP) Venezuelan opposition's new envoy in Washington Carlos Vecchio speaks to members of the media after a Senate Foreign Relations Committee meeting on Capitol Hill in Washington, Jan. 30, 2019. Abrams referred questions about Bolton's notes to the White House, but said the U.S. was focused on diplomatic and economic tools, as well as the security of American diplomats and private citizens still in the country. "We're in a supporting role here," he told reporters Wednesday. "We are completely supportive of what they've done, and we will continue to do things like the sanctions, like these diplomatic steps" to ramp "up the pressure on the regime." While those sanctions have targeted Venezuela's state-owned oil firm PdVSA, its U.S. subsidiary Citgo has been exempted. Bolton met the company's executive team at the White House Wednesday "to make sure that the economic benefits of Venezuela's resources are not pilfered by Maduro and his cronies," he said in a tweet, calling the meeting "very productive." Chief among those administration's next actions now is getting humanitarian aid into the country. Secretary of State Mike Pompeo announced an initial $20 million in aid last week and Abrams said there would be more funds -- although how much is up to Congress, he added, where the administration has garnered rare bipartisan support for its efforts. But getting that aid into the country has been difficult as Maduro has blocked it in previous years. The U.S. is working with Latin American countries, the European Union and international institutions to do that, Abrams said. Efforts could include establishing a humanitarian corridor, working with humanitarian aid groups and Venezuelan neighbors Colombia and Brazil, but it would require the cooperation of Maduro, making it less likely. (Edilzon Gamez/Getty Images) People protest during a demonstration against the government of President Nicolas Maduro called by the opposition leader self-proclaimed acting president Juan Guaido, Jan. 30, 2019, in Caracas, Venezuela. Beyond the immediate needs of Venezuela's 32 million people, who face food and medicine shortages and inflation so high it has made everyday goods unaffordable, the country will also require long-term help rebuilding, Abrams added. On Thursday, Vecchio will meet with Treasury Department and White House officials to discuss how Guaidó's government could access the Maduro government's assets in U.S. banks that the Trump administration has frozen and tried to keep Maduro from draining. Abrams did not know how much money that included and said the U.S. was still figuring out what assets Venezuela has overseas and which ones could be reached. But he urged patience and said the massive protests in the country "suggests that the outcome will be a return to democracy. The question is how long does it take to get there, and can we all ... find a path forward that is peaceful, that does not involve violence." 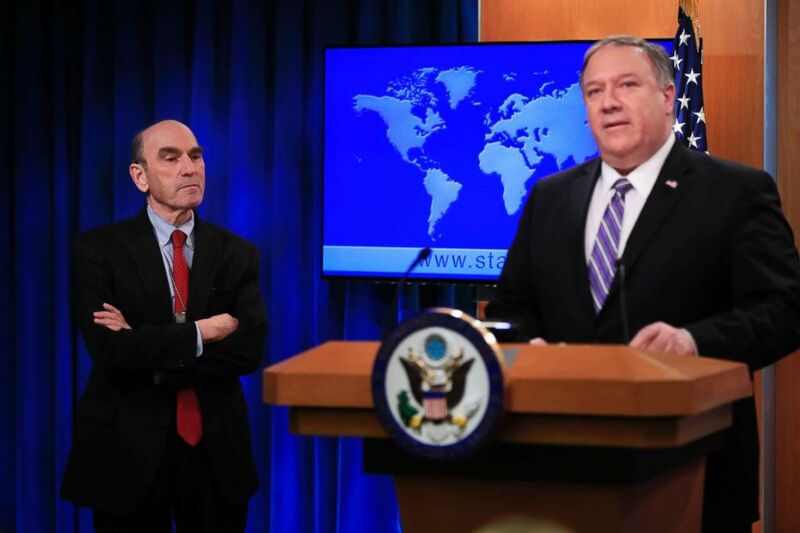 (Manuel Balce Ceneta/AP) Elliott Abrams, left, listens to Secretary of State Mike Pompeo talk about Venezuela at the State Department in Washington D.C., Jan. 25, 2019. Abrams is a controversial choice to lead the administration's Venezuela efforts because he's most well-known for his work as the top U.S. diplomat for Latin America under President Ronald Reagan. During that time, the U.S. helped to crush opposition to right-wing dictatorships in El Salvador and Nicaragua. Abrams later pleaded guilty to misleading Congress during the Iran-Contra affair. But the special envoy said that was not an issue in his current role and that allies and partners had not raised it. However, Maduro's representative at the United Nations on Saturday did highlight it. "We are not focused on the events of the 1980s," Abrams said. "We are focused on the events of 2019."